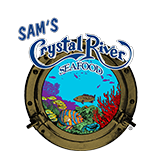 You may redeem this card for food or beverages at any Sam’s St. Johns Seafood Restaurant, or Crystal River Seafood Restaurant. Card may not be redeemed for cash, except as required by law. Original activation receipt is required for replacement of lost or stolen gift cards. No service fees are charged in connection with this card. US Postal Service – $2.95. Upgrade to USPS Priority Mail for $6.70 more. Need it faster? USPS Overnight Delivery – $24.70 additional. Where can your gift cards be redeemed? Our gift cards never expire and we do not charge any fees. All gift card sales are final. Lost or stolen cards may be cancelled and replaced with proof of purchase. 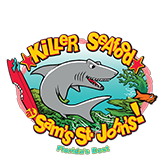 Please contact us at info@lovethatseafood.com for further information. Yes, orders of $1,000 or more do qualify for 10% in additional gift cards free of charge.